Jaba: A madrasa, or Islamic school, on a remote hilltop in northeastern Pakistan that was the target of an Indian air strike just over six weeks ago is still not ready to give up its secrets. The expectation among some of the visitors was that it might help to settle a number of mysteries about the attack. In particular, whether, as India had said, it was a huge success and took out a major militant training camp or whether – as Pakistan says – India’s warplanes missed the madrasa compound completely and hit surrounding hills instead. The difference – as many as 300 dead militants or no fatalities at all. 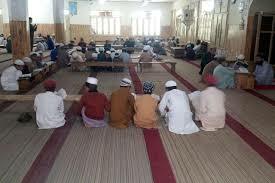 The interactions with teachers and about 100 children at the madrasa – from the very young to older teenagers – were limited. The visitors were shown a group of children learning passages from the Koran partly by rocking their heads back and forward in rhythm. One teacher said he had worked at the madrasa for six years. The claims have been an issue in India’s general election, which started on Thursday. Senior government officials – including Prime Minister Narendra Modi – have attacked opposition politicians who ask for evidence as unpatriotic. The main madrasa building itself doesn’t appear to be reinforced in any major way – it has a metal roof with some modest wooden beams.